P4 power extension cable, 150mm P4 power extension cable, 150mm. List Price 2.40лв. VAT Incl. 2.28лв. VAT Incl. 2.16лв. VAT Incl. Power cable VLCP73520V015, Molex/m - 2xSATA 15pin/f, 150mm Transitional cable from Molex to 2xSATA and length 150 mm. 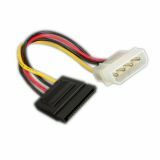 SATA Power cable, 0.15m Molex to SATA 15.5 mm. Cable Molex, 4pin Molex/m - 2xMolex 4pin/m, 0.15m Molex coupler cable from 1x4 pin molex to 2x4 pin molexs with length 0.15m. List Price 2.50лв. VAT Incl. 2.25лв. VAT Incl. 2.00лв. VAT Incl. 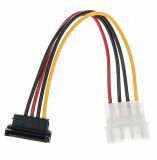 Cable Serial ATA-4pin molex Data cable Serial ATA-4pin molex. Internal Power Cable EPS 8-Pin Male - P4 Female 0.15 m Internal Power Cable EPS 8-Pin Male - P4 Female 0.15 m.
Cable VLCP74210V015, 2 x Molex/M - PCI express/F, 150mm The PCI Express (6 pin) cable provides extra power to the video card and other computer parts, the cable transfers power from the 2 x Molex connector to a 6 pin jack.